Just looking at it activates your life force, your Chi energy. Mega powerful (sacred-geometry) portal for Divine Energy. 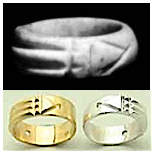 Its key element is a geometric, crystal-like pattern (at right) carved as stone ring found in Afraka's Valley of the Kings. It is mislabeled "Atlantis" Ring though it is Afrakan (Kamitan, ancient Egyptian). It is widely reproduced as jewelry (rings, bracelets and pendants). The double-terminated crystal pattern alone is highly potent, revitalizing, and protecting. A jewelry webpage reported on the pattern's origin and protective powers: "The [[stone]] ring was discovered at around 1860 in the Valley of the Kings in Egypt by Marquis d'Argain who later gave the ring to Arnold de Belizal. It eventually found its way to Howard Carter, the discoverer of King Tut Ankh Amon's tomb. Howard Carter proclaimed that he was saved from the curse of death by this ring. Within 18 months of the opening of the tomb, all people involved with the find died, except Howard Carter." The ancient crystal pattern is combined with layered nested circles of rainbow colors which activates nearly all parts of the human energy body. 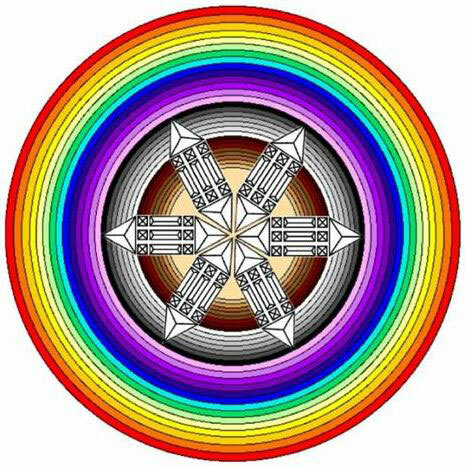 An energy-sensitive person I met said this mandala resonates balancing Earth-energy, therefore I call it the "Earth-Rainbow Healing Mandala." Charge your water, food, vitamins, medicine, clothing, bed, pillow.. by placing a mandala under it. Put 1 or more large ones in your refrigerator. The energy goes through glass, metal, plastic and most materials. Make copies in various sizes; laminate some. Put a big one on your home /office walls. Open up the back of your mobile cell phone and insert a small (preferably laminated) madala, facing down. This makes your phone much safer to use. Place (or tape) them directly on pain spots, headaches, acupoints. Plus look at another mandala while healing takes place. Healing may take minutes, hours, days, depending on ailment. The mandala doesn't replace professional help but does give amazing results. To do distant healing, place patient's photo or name between 2 mandalas. "Transmit energy to them from your hands for 15 to 20 minutes. ..prayers /invocations greatly enhance healing." Leave photo between the mandalas for a period.